Phytochemical investigation and bioactivities of Alternanthera ramosissima (Mart.) Chodat and Hassl. Background: Since there are many researches of phytochemical and bioactivities from genus Alternanthera but did not have any reports from Alternanthera ramosissima. Objective: The objective of the study is to isolate, identify, and determine the bioactivities of the chemicals in this plant, which has not been reported. 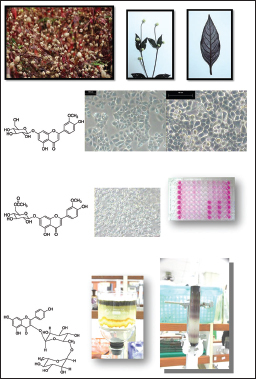 Materials and Methods: Bioactivity studies of A. ramosissima ethanol extracts were as cytotoxic activity against human cancer cells (human breast carcinoma cell (MCF-7), human cervical carcinoma cell (KB), human cervix adenocarcinoma cell (HeLa) and human colon adenocarcinoma cell (HT-29)) and anti-inflammation. Chromatographic and spectroscopic techniques were used for the isolation and identification of pure compounds. Results: A. ramosissima extracts had the potential effects of cytotoxic activity against human cancer cells and anti-inflammation. Six compounds were isolated; two mixture compounds as the mixture of β-sitosterol and stigmasterol, the mixture of spinasterol and stigmast-7-en-3 β-ol; and four pure compounds as β-sitosterol-D-glucoside, 7-O-β-D-glucopyranosyl chrysoeriol, 7-O-(6”-O-Acetyl)-β-D-glucopyranosyl chrysoeriol, and kaempferol-3-O-β-rutinoside. The isolated compounds were determined the cytotoxic activity against human cancer cells and anti-inflammatory activity. The results showed that all of them did not have cytotoxic activity against human cancer cells. However, the isolated compounds; 7-O-β-D-glucopyranosyl chrysoeriol and 7-O-(6”-O-Acetyl)-β-D-glucopyranosyl chrysoeriol exhibited the potential effect of anti-inflammation by nitric oxide inhibition with IC50as 25.30 and 39.81 μM, respectively, when compared with the positive standards; indomethacin, caffeic acid phenethyl ester, and L-nitroarginine which showed nitric oxide inhibition with IC50as 50.30, 5.62, and 61.80 μM, respectively. Conclusion: This is the first report of chemicals and bioactivities of A. ramosisima and the first report of cytotoxic and anti-inflammatory activities of isolated compounds; 7-O-β-D-glucopyranosyl chrysoeriol and 7-O-(6”-O-Acetyl-)-β-D-glucopyranosyl chrysoeriol. Abbreviations used: MCF-7: Human breast carcinoma cell, KB: Human cervical carcinoma cell, HeLa: Human cervix adenocarcinoma cell, HT-29: Human colon adenocarcinoma cell, HGF: Human gingival fibroblast cell, IC50: The half maximal inhibitory concentration, DMEM: Dulbecco's Modified Eagle Medium, cDMEM: Completed DMEM medium, DMSO: Dimethyl sulfoxide, SRB: Sulforhodamine B, NO: Nitric oxide, EIMS: Electron ionized mass spectrometry, NMR: Nuclear magnetic resonance, 1H NMR: Proton NMR, 13C NMR: Carbon-13 NMR. However, isolated compounds; 7-O-b-D-glucopyranosyl chrysoeriol and 7-O-(6”-O-Acetyl)-b-D-glucopyranosyl chrysoeriol exhibited the potential effect of anti-inflammation. Searching drugs from herbal medicines or plants have become important because the medicines from natural origins are increasing. Drug of natural origins have been classified as original natural products, products derived from semi-synthetically or synthetically products based on natural product model. Hence, the natural products have played and continue to play in the drug discovery process. Study of herbal medicines such as phytochemical investigation and bioactivities are an alternative way to find the active compounds and biological effects. The results are giving the documents, which can use to prove and support the traditional used or drug development. This is the way that the researchers are interesting. This study belongs to Plant Genetic Conservation Project under The Royal Initiative of Her Royal Highness Princess Maha Chakri Sirindhorn (RSPG project), 140 plant samples were collected from Plant Genetic Protection Area of RSPG project, Rajjaprabha Dam EGAT, Suratthani province, Thailand. These samples were screened for cytotoxic activity against human cancer cells, anti-inflammatory, anti-microbial, and anti-acetylcholinesterase activities. After bioactivities screening, Alternanthera ramosissima, which showed the potential of cytotoxic activity against human cancer cells and anti-inflammatory activity was selected for further study. A. ramosissima is the plant in the family of Amaranthaceae. It did not have any records in traditional used. However, A. sessilis and A. bettzickiana were used in traditional Thai medicine by using the whole plant for treatment of the menstrual disorder, blood tonic, and mild laxative. A. bettzickiana was used in traditional Thai recipe for treatment of premenstrual pain, migraine, and sleeplessness and anti-HIV virus. Since there are many researches of phytochemical and biological activities from genus Alternanthera but did not have any reports of chemical constituents and biological activities of A. ramosissima. Hence, this will be the first report of chemical constituents and biological activities of A. ramosissima, especially cytotoxicity and anti-inflammation. Furthermore, these results will give the information of the new natural sources of medicines for anti-cancer and anti-inflammation. A. ramosissima was collected from The Bureau of the Royal Household at Plant Genetic Protection Area of RSPG, Rajjaprabha Dam EGAT, Suratthani Province, Thailand. The plant was identified by Miss Sukhothip Sirimongkhol; botanist from the Office of the Forest Herbarium, Department of National Parks, Wildlife and Plant Conservation, Ministry of Natural Resources and Environment, Bangkok, Thailand. The herbarium specimen (SKP 007 01 18 01) was stored as a reference at Department of Pharmacognosy and Pharmaceutical Botany, Faulty of Pharmaceutical Sciences, Prince of Songkla University, Songkhla, Thailand. The fresh plant was cleaned and separated to leaf, stem, and flower. The samples were dried at 60°C for 48 h. The dried powder samples were macerated with various solvents followed by the polarity; petroleum ether, ethyl acetate, ethanol, and water, respectively. Maceration method was performed at room temperature for 3 days (×3 times). The filtrate was evaporated by using rotary evaporator under reduced pressure at 42°C. Crude extracts were kept in 4 °C until determination. Cytotoxic activity against human cancer cells was evaluated using sulforhodamine B (SRB) colorimetric assay., SRB assay is used for measuring the cellular protein content by using two of sulfonic group bind to basic amino-acid in the cell under the mild acid condition, which showed pink color. The experiment was tested in 96 well plates and used microplate reader to detect visible light at 492 nm. Four human cancer cells; human breast carcinoma cell line (MCF-7), CLS NO. 300273; human cervical carcinoma cell line (KB), CLS NO. 300446; human cervix adenocarcinoma cell line (HeLa), ATCC NO. CCL-2; human colon adenocarcinoma (HT-29), CLS NO. 300215; and a human normal cell, human gingival fibroblast cell line (HGF) were cultured in Dulbecco's Modified Eagle Medium (DMEM) supplemented with NaHCO3, antibiotic-antimycotic (50 IU/ml penicillin G sodium, 25 IU/ml streptomycin sulfate and 0.125 μg/ml amphotericin B (Fungizone®) and adjusted pH to 6.8–7.2 by added 1 N HCl and 1 N NaOH. Completed DMEM medium (cDMEM) has supported with 10% fetal bovine serum. After this, the cell was incubated at 37°C in a humidified atmosphere containing 5% CO2. Samples were dissolved in DMSO and diluted with cDMEM to give the final concentration 25 μg/ml for crude extracts and various concentrations of isolated compounds. The cancer cells and normal cell were added to 96 well plates at 5 × 104 cells/well. After incubated for 24 h, the sample was added and treated for 72 h. Then, replaced with a fresh media and incubated for 72 h. After that, fixed the cell with cold 10% trichloroacetic acid and kept at 4°C for an hour. Rinsed the cell with water and dried the plate or allow them to air-dry at room temperature. Added 0.4% SRB which was dissolved in 1% acetic acid and left at room temperature for 30 min then rinsed the cell with 1% acetic acid 4 times. Dried the plate or allow them to air-dry at room temperature. 10 mM Tris bases (pH 10.5) was added and then shake for dissolve the SRB color, then measured at 492 nm by using microplate reader. Camptothecin was used as positive control. The percentage of cytotoxic activity was calculated follow the equations as showed below. The anti-inflammatory assay was tested by using NO inhibitory effect using RAW264.7 cells, and the method was followed by Tewtrakul et al., 2009. Nitric oxide production was determined by measuring the accumulation of nitrite in the culture supernatant using the Griess reagent. The reagent contains two chemicals: sulfanilic acid and N-(1-naphthalenediamine). Under acidic condition sulfanilic acid (sulfanilamide) is converted by nitrite to a diazonium salt. N-(1-naphthalenediamine) was added to form a colored azo dye that can be detected at 570 nm. The RAW264.7 cells were cultured in RPMI-1640 medium supported with NaHCO3, antibiotic-antimycotic (50 IU/ml penicillin G sodium, 25 IU/ml streptomycin sulfate and 0.125 μg/ml amphotericin B (Fungizone®) and adjusted pH to 6.8–7.2 by added 1N HCl and 1 N NaOH. Completed RPMI-1640 medium (cRPMI) has supported with 10% fetal bovine serum. After this, the cell was incubated at 37°C in a humidified atmosphere containing 5% CO2. Samples were dissolved in DMSO and diluted with culture medium to give 100 μg/ml for crude extract and various concentrations of isolated compounds. The cells were added in 96-well plates with 1 × 105 cells/well and incubated for 1 h at 37°C in a humidified atmosphere containing 5% CO2. After that, the medium was replaced with a fresh medium containing 100 μ l of lipopolysaccharide (LPS) (1 μg/ml), then incubated for an hour. Then, added 100 μ l of test samples at various concentrations then incubated for 48 h. Nitric oxide production was determined by measuring the accumulation of nitrite in the culture supernatant using the Griess reagent. L-nitroarginine (L-NA), indomethacin and caffeic acid phenethyl ester (CAPE) were used as positive controls. Inhibition (%) was calculated by using the equation as showed below. IC50 values were determined graphically (n = 4). The percentage of nitric oxide inhibition was calculated to follow the equation. The extracts of A. ramosissima did not show cytotoxic activity against human cancer cells [Table 1]. 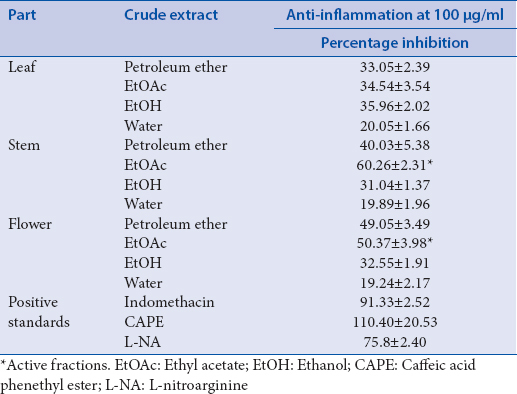 In the other way, ethyl acetate extract of stem and flower showed moderate anti-inflammatory activity [Table 2]. Thus, this plant was selected for further study of phytochemistry to find the active compounds and bioactivities of each isolated compound. Two mixture compounds and four pure compounds were isolated from leaf and flower of A. ramosissima. Two mixture compounds are the mixture of β-sitosterol and stigmasterol (1) (the approximate ratio as 7:3) and a mixture of spinasterol and stigmast-7-en-3β-ol (2) (the approximate ratio as 2:1). Four pure compounds are steroid glycoside as β-sitosterol-β-D-glucoside (3); flavonoid mono-glycoside as 7-O-β-D-glucopyranosylchrysoeriol (4) and 7-O-(6”-O-Acetyl-)-β-D-glucopyranosychrysoeriol (5); a flavonoid diglycoside as kaempferol-3-O-rutinoside (6). Chemical structures of compounds; 4, 5, and 6 are shown in [Figure 1]. 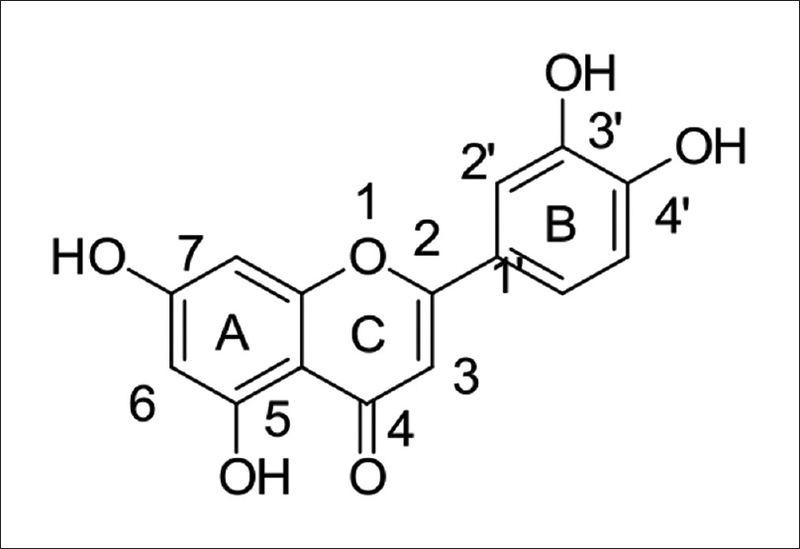 Figure 1: The chemical structures of 7-O-b-D-glucopyranosylchrysoeriol (4), 7-O-(6’’-O-Acetyl)-b-D-glucopyranosylchrysoeriol (5) and kaempferol-3-O-b-rutinoside (6). Chrysoeriol-7-O-β-glucopyranoside (C22H22O11); MP: 175.32°C. IR (KBr): 3371, 2921, 1658, 1603, 1497, 1073 cm−1. UV/Vis λmax(Pyridine): 269, 350 nm. EIMS: 461.6 m/z. 1H NMR (300 MHz, DMSO-d6): 6.98 (1H, s, H-3), 6.45 (1H, d, J = 2.1 Hz, H-6), 6.87 (1H, d, J = 2.1 Hz, H-8), 7.58 (1H, br. s, H-2'), 6.93 (1H, d, J = 9 Hz, H-3'), 7.61 (1H, d, 6.9 Hz, H-6'), 3.89 (3H, s, H-OCH3). Proton of sugar moiety; glucose: 5.07 (1H, d, J = 6.3 Hz, H-1``), 3.15-3.50 (4H, m, H-2``-5``), 3.47 (1H, m, H-6``), 3.72 (1H, dd, J = 9.9, 5.1 Hz, H-6``). 13C NMR (75 MHz, DMSO-d6): 164.16 (C, C-2), 103.42 (C, C-3), 182.01 (C, C-4), 161.08 (C, C-5), 99.51 (CH, C-6), 162.96 (C, C-7), 95.02 (CH, C-8), 156.90 (C, C-9), 105.34 (C, C-10), 121.30 (C, C-1'), 110.26 (C, C-2'), 148.06 (C, C-3'), 150.99 (C, C-4'), 115.80 (CH, C-5'), 120.51 (CH, C-6'), 55.98 (CH3, C-OCH3). Carbon of sugar moiety; glucose: 100.04 (CH, C-1``), 73.11 (CH, C-2``), 77.24 (CH, C-3``), 69.62 (CH, C-4``), 76.45 (CH, C-5``), 60.63 (CH2, C-6``). The NMR data was compared with a previous report. 7-O-(6``-O-Acetyl)-β-D-glucopyranosylchrysoeriol (C24H24O12); MP: 176.00°C. IR (KBr): 3393, 2920, 1738, 1658, 1603, 1497, 1259, 1073 cm−1. UV/Vis λmax(Pyridine): 269, 352 nm. EIMS: 503.5 m/z. 1H NMR (300 MHz, DMSO-d6): 6.99 (1H, s, H-3), 6.45 (1H, d, J = 2.4 Hz, H-6), 6.82 (1H, d, J = 2.2 Hz, H-8), 7.59 (1H, br. s, H-2'), 6.96 (1H, d, J = 8.7 Hz, H-3'), 7.60 (1H, d, 5.6 Hz, H-6'), 3.90 (3H, s, H-OCH3). Proton of sugar moiety; glucose: 5.17 (1H, d, J = 6.8 Hz, H-1``), 3.15-3.74 (4H, m, H-2``-5``), 4.06 (1H, dd, J = 11.9, 7.2, H-6``), 4.34 (1H, dd, J = 11.9, 2.1 Hz, H-6``), 2.00 (3H, s, H-CH3 COOR). 13C NMR (75 MHz, DMSO-d6): 164.17 (C, C-2), 103.45 (C, C-3), 182.01 (C, C-4), 161.20 (C, C-5), 99.64 (CH, C-6), 162.68 (C, C-7), 94.92 (CH, C-8), 156.88 (C, C-9), 105.39 (C, C-10), 121.27 (C, C-1'), 110.46 (C, C-2'), 148.08 (C, C-3'), 151.05 (C, C-4'), 115.78 (CH, C-5'), 120.48 (CH, C-6'), 56.04 (CH3, C-OCH3). Carbon of sugar moiety; glucose: 99.46 (CH, C-1``), 73.00 (CH, C-2``), 76.21 (CH, C-3``), 69.86 (CH, C-4``), 73.83 (CH, C-5``), 63.36 (CH2, C-6``), 20.51 (CH3, C-CH3 COOR). The NMR data was compared with a previous report. Kaempferol-3-O-β-rutinoside (C27H30O15); MP: 174.08°C. IR (KBr): 3412, 2929, 1733, 1657, 1606, 1384, 1180, 1066 cm−1. UV/Vis λmax(MeOH): 222, 266, 346 nm. FABMS: 595.5 m/z [M + H] +. 1H NMR (500 MHz, MeOH-d4): 6.18 (1H, d, J = 1.95 Hz, H-6), 6.37 (1H, d, J = 1.95 Hz, H-8), 6.88 (1H, d, J = 8.79 Hz, H-2'), 8.06 (1H, d, J = 8.79 Hz, H-3'), 6.88 (1H, d, J = 8.79 Hz, H-5'), 8.06 (1H, d, J = 8.79 Hz, H-6). Proton of sugar moieties; glucose: 5.10 (1H, d, J = 7.57 Hz, H-1``), 3.80 (1H, dd, J = 10.98, 1.22 Hz, H-6``), 3.36 (1H, m, H-6``). Rhamnose: 4.31 (1H, d, J = 1 Hz, H-1``'), 1.11 (3H, d, J = 6.1 Hz, H-6``'). 13C NMR (125 MHz, MeOH-d4): 158.65 (C, C-2), 135.50 (C, C-3), 179.46 (C, C-4), 161.61 (C, C-5), 101.94 (CH, C-6), 166.0 (C, C-7), 95.17 (CH, C-8), 159.26 (C, C-9), 105.37 (C, C-10), 122.80 (C, C-1'), 132,43 (CH, C-2'), 116.16 (CH, C-3'), 161.51 (C, C-4'), 116.13 (CH, C-5'), 132.34 (CH, C-6'). Carbon of sugar moieties; glucose: 104.72 (CH, C-1``), 75.78 (CH, C-2``), 78.20 (CH, C-3``), 71.47 (CH, C-4``), 77.24 (CH, C-5``), 68.59 (CH2, C-6``). Rhamnose: 102.44 (CH, C-1``'), 72.10 (CH, C-2``'), 72.32 (CH, C-3``'), 73.93 (CH, C-4``'), 69.73 (CH, C-5``'), 17.91 (CH3, C-6``'). The NMR data was compared with a previous report. All the isolated compounds were determined by cytotoxic activity against human cancer cell and anti-inflammatory activity. They did not show cytotoxic activity against human cancer cell [Table 3]. 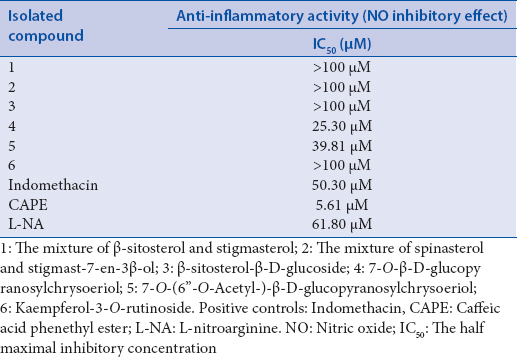 However, chrysoeriol-7-O-glucopyranoside (4) and 7-O-(6”-O-Acetyl-)-β-D-glucopyranosylchrysoeriol (5) showed the potential of anti-inflammatory activity [Table 4]. The isolated compounds of A. ramosissima were tested with cytotoxic activity against human cancer cells. The results showed that all the isolated compounds did not exhibit with cytotoxic activity against human cancer cells. The previous studies showed the factor of structural requirements of flavonoid that can be affecting to cytotoxic activity. The variation in ring C; the C2-C3 double bond, the oxo group at C-4, an open ring C, the position of ring B in at C-2 and C-3 in ring C and the replacement of oxygen at position 1 in ring C by nitrogen or sulfur atoms can produce high variation in the activity. Type and number of substituents; sugar moiety and polyhydroxylation reduce the hydrophobicity of flavonoid thereby making difficult flavonoids entry into the cell. Sometimes, this effect might decrease their efficacy, but other time, an increasing of hydrophobicity is necessary to obtain a good interaction between the flavonoid and a determined target implicated in cancer, as well as a different number of substituents, can increase or decrease the anticancer activity. The position of substituents; variations of substituents at different positions have been extensively shown to alter the efficacy of a flavonoid. Substitution patterns; the author has mentioned about the structural substituents of flavonoid as 3', 4'-OH at ring B, or 5, 7-OH at ring A, the pattern is present in many of the most active flavonoids found in his study [Figure 2]. The isolated compounds were tested with NO inhibition, the result showed that 7-O-(6``-O-Acetyl)-β-D-glucopyranosylchrysoeriol had the moderate potential activity with IC50 as 39.81 μM and chrysoeriol-7-O-glucopyranoside also showed the moderate potential activity with IC50 as 25.30 μM, when compared with positive standards; indomethacin, CAPE and L-NA; IC50 as 50.3, 5.61, and 61.8 μM, respectively. 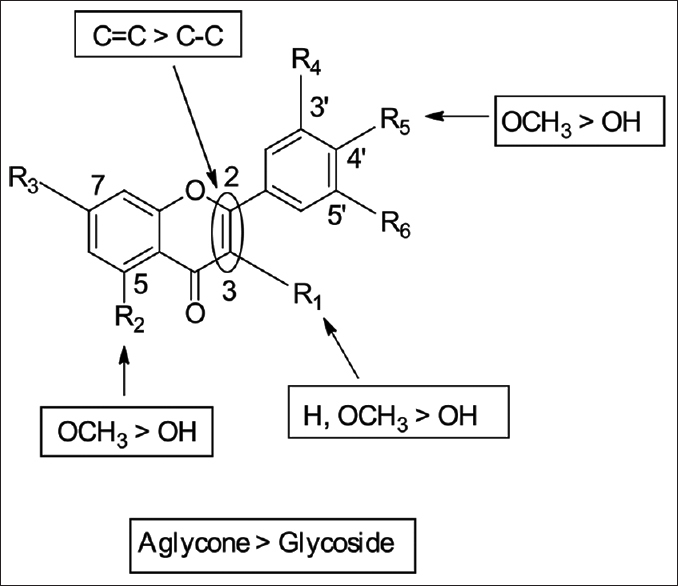 From the previous study, it has been reported about the structural requirement of flavonoids for NO inhibition, which was suggested as follows [Figure 3]; (1) the activity of flavones were stronger than flavonols, (2) the glycoside or sugar moiety reduced the activity, (3) the activity of flavones were stronger than flavanones, (4) the flavones and flavonols having the 4'-hydroxyl group showed stronger activity than those missing the hydroxyl group at the B ring, (5) the flavonols having the 3',4'-dihydroxyl group (catechol type) showed stronger activities than having the 3', 4',5'-trihydroxyl group (pyrogallol type), (6) the 5-hydroxyl group have a tendency to increase the activity, (7) methylation of the 3, 5, or 4'-hydroxyl group enhanced the activity, (8) the activity of isoflavones were weaker than flavones, (9) methylation of the 3-hydroxyl group reduced the cytotoxicity. Hence, two mixture compounds and four pure compounds were isolated from leaf and flower of A. ramosissima. Two mixture compounds are the mixture of β-sitosterol and stigmasterol (the approximate ratio as 7:3) and mixture of spinasterol and stigmast-7-en-3β-ol (the approximate ratio as 2:1). Four pure compounds are steroid glycoside as β-sitosterol-β-D-glucoside; flavonoid monoglycoside as 7-O-β-D-glucopyranosylchrysoeriol and 7-O-(6”-O-Acetyl)-β-D-glucopyranosylchrysoeriol; a flavonoid diglycoside as kaempferol-3-O-rutinoside. All of isolated compounds were determined of cytotoxic activity against human cancer cells and anti-inflammatory activity. They did not show cytotoxic activity against human cancer cells. However, chrysoeriol-7-O-glucopyranoside and 7-O-(6”-O-Acetyl-)-β-D-glucopyranosylchrysoeriol showed the potential of anti-inflammatory activity. Finally, this is the first report of chemical constituents and bioactivities of A. ramosisima. It also will be the first report of cytotoxic and anti-inflammatory activities of isolated compounds; 7-O-β-D-glucopyranosylchrysoeriol and 7-O-(6”-O-Acetyl-)-β-D-glucopyranosylchrysoeriol. The authors would like to thank Department of Pharmacognosy and Pharmaceutical Botany and the Pharmaceutical Laboratory Service Center, Faculty of Pharmaceutical Sciences, Prince of Songkla University for the lab space and equipment. This study was financially supported by the Plant Genetic Conservation Project under The Royal Initiative of Her Royal Highness Princess Maha Chakri Sirindhorn (RSPG project). Cragg GM, Newman DJ, Snader KM. Natural products in drug discovery and development. J Nat Prod 1997;60:52-60. Anandechakunkorn S. Thai herb modified traditional drugs for treatment of pain, migraine and various other diseases. Switzerland: World Intellectual Property Organization (WIPO); 2012. Mier W, Beijer B, Graham K, Hull WE. Fluorescent somatostatin receptor probes for the intraoperative detection of tumor tissue with long-wavelength visible light. Bioorg Med Chem 2002;10:2543-52. Tewtrakul S, Subhadhirasakul S, Karalai C, Ponglimanont C, Cheenpracha S. Anti-inflammatory effects of compounds from Kaempferia parviflora and Boesenbergia pandurate. Food Chem 2009;115:534-8. Held P. An Introduction to Reactive Oxygen Species Measurement of ROS in Cells, Application Guide. United States of America: BioTek Instruments, Inc.; 2012. Harput US, Calis I, Saracoglu I, Donmez AA, Nagatsu A. Secondary metabolites from Phlomis syriaca and their antioxidant activities. Turk J Chem 2006;30:383-90. Alipieva KI, Kostadinova EP, Evstatieva LN, Stefova M, Bankova VS. An iridoid and a flavonoid from Sideritis lanata L. Fitoterapia 2009;80:51-3. Hou WC, Lin RD, Lee TH, Huang YH, Hsu FL, Lee MH. The phenolic constituents and free radical scavenging activities of Gynura formosana Kiamnra. J Sci Food Agric 2005;85:615-21. López-Lázaro M. Flavonoids as anticancer agents: Structure-activity relationship study. Curr Med Chem Anticancer Agents 2002;2:691-714. Matsuda H, Morikawa T, Ando S, Toguchida I, Yoshikawa M. Structural requirements of flavonoids for nitric oxide production inhibitory activity and mechanism of action. Bioorg Med Chem 2003;11:1995-2000.